Mudpies to Dragonflies: WFMW: Pick Your Nose? When I was fixing lunch I came across an almost-gone bag of animal crackers. The chocolate ones. I dumped the little bits out into a bowl and thought to myself, "Nobody is going to eat these cracker bits." As the boys were scarfing mouthfuls of canned ravioli I said, "Hey, look! A whole bowl of animal cracker heads, tails, arms, legs and noses!" Suddenly the whole thing became a boy-friendly, gross bowl of animal cracker parts waiting to be munched. The boys eagerly grabbed for "bits" to stir into their yogurt. And the most popular cracker bit? The nose, of course. What self-respecting male (regardless of age) can resist the offer to "Pick a nose?" Gross? I know, but it Works for Me! :) With little kids around, you've gotta be willing to be gross... once in a while. 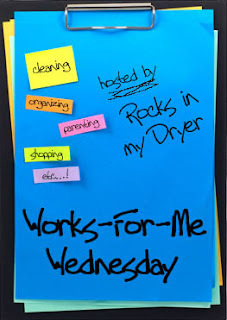 For more great (and maybe, not-so-gross) Works for Me Wednesday tips visit Shannon at Rocks in My Dryer. 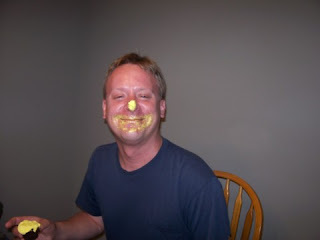 And if you were to pick a nose, how 'bout the nose from the unusual, but lovable, yellow-cupcake-crusted-daddy? Ooooh, my boys would love this idea and we just bought animal crackers. 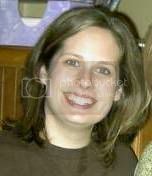 Thanks for visiting my site and for a great idea! How funny! I love it!! Cute! Great idea for using ub the last bits no one seems to want.